My liberal friends, all three of them, are up in arms over the Indiana RFRA controversy. As usual, their views on the issue are driven by emotion, not reason. That is because liberalism is not really a political philosophy. It is a stage of arrested emotional development. 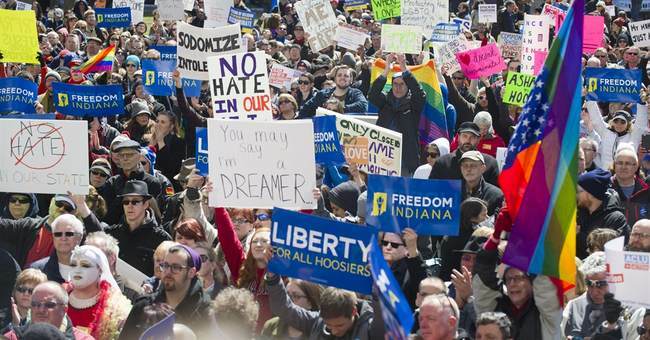 Since the Indiana RFRA controversy revolves around their core religion, which is the so-called gay rights movement, their emotionally laden “political” observations are not likely to subside in the near future. Until then, it helps to understand what the current crisis in Indiana is really all about. Hint: It’s the same thing we were arguing about in the War Between the States. It’s also the very thing we were debating in the 1960s civil rights movement. It’s a thing called involuntary servitude. If you are unsure of where you stand on the RFRA controversy, please allow me to share a story that will help clarify the issue. At the end of the story, I’m going to ask you a very simple question. If your answer to that question is “yes” then you are opposed to the Indiana RFRA law. If your answer to that question is “no,” then you support it. A few years ago, I declined a wedding invitation from a friend. His wife is an alcoholic and he joked about how she would probably stumble her way down the aisle adding that he hoped she wouldn't fall on the way to the front of the church. I decided I didn't want to be a part of a ceremony that would mock the institution of marriage. Now imagine I were still playing guitar at weddings for a living - as I once did before I took a pay cut and became a professor. Would anyone seriously assert that I should be forced to play at the wedding I would not even want to attend? Once again, if your answer to that question is “yes” then you are opposed to the Indiana RFRA law. If your answer to that question is “no,” then you support it. Some may argue that the thought experiment isn’t relevant because homosexuals and stumbling drunks aren’t the same thing – only the former are part of a protected class. Newsflash: homosexuality is not the same thing as blackness. You can’t work your way into a legitimate protected class through self-destructive behavior. Next thing you know stumbling drunks will be arguing the same thing – and citing the genetic predisposition to alcoholism to bolster their claim! All of this nonsense about protected classes is utterly beside the point. One would never argue that a black baker should have to serve food at a Klan rally. Learning that a few of the Klansmen were not ordinary whites - but also homosexuals - would not change the equation one iota. The issue is still involuntary servitude. Some have expressed a concern that the new Indiana law and others like it might be used to justify blatant forms of discrimination. Perhaps a truly homophobic restaurant owner would refuse to serve gays – just like racist restaurant owners used to refuse service to blacks. Government imposed tolerance merely masks true bigotry. Sunlight, in the form of freedom of speech, is the only effective disinfectant. One hundred years ago, true progressives like Louis Brandeis understood that. Now, most people who call themselves “progressive” would be more aptly named regressive. But the Democrat Party has never really been a progressive party. In the final analysis, little has changed in the last 200 years. Republicans are simply trying to end slavery while Democrats are tying to impose it.